Remembering the Atajos — Gray School of Arms. Western Martial Arts and Fitness. The Atajo is a key technique in Destreza. While the word atajo literally means “Short cut” it is not an offensive technique, rather it is a way of controlling the opponent’s sword to defend yourself and thereby attack in safety. In another article I’ll go into details on the mechanics behind an atajo and how to apply one successfully. This one will focus on the 8 atajos as described by Rada. Rada’s 8 atajos describe every possible position that your sword can take in the bind. He also gives a list of techniques to follow from each of the atajos, which makes them an excellent roadmap for use during training and competitive bouts. Remembering which number each atajo is can be kind of difficult, so I’m going to give a few pointers as to how I remember each of the atajos. The number eight comes from having 3 variables, each of which can have two different values. The first two variables (angle and position) describe how your sword crosses the opponent’s. The last (footwork) dictates the direction you step on making the atajo, which in turn determines what techniques you can execute to follow it. In atajos 1, 2, 3 and 4 your sword takes the obtuse angle. This means that the tip is raised higher than the guard and you bind to your opponent’s sword from above using your true edge. For atajos 5, 6, 7 and 8 your sword should be in the acute angle, with the hilt raised higher than the point and your opponent’s sword bound on the false edge. Earlier authors on Destreza considered the acute angle to be disadvantageous, but it became more widely used by the time Rada wrote his book. 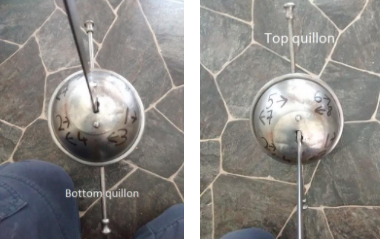 For atajos 1, 3, 6 and 8 your sword is placed on the inside line, for the 2, 4, 5 and 7 it is on the outside. Since the atajo involves crossing swords with your opponent the tip of your sword may be on the opposite line, but for the sake of consistency I’ll refer to where your handle is. If Destreza were a linear system of fencing angle and position would be enough to describe the atajos. However, since the system focsues on moving off the line we need an extra variable for footwork since you will step either left or right. For atajos 1, 2, 5 and 6 the initial step is to the left and for atajos 3, 4, 7 and 8 the initial step is to the right. This means that the initial hand movement for (for example) atajos 1 and 3 are the same, but subsequent options are very different as you are on the opposite side of your opponent’s sword. Putting all of that together gives you this chart. Hopefully you will find it useful in your training. The atajos follow a set pattern which makes remembering the numbering easier. For angle the pattern is obtuse x4, then acute x4. The position goes from inside to outside for atajos 1, 2, 3 and 4, then outside to inside for atajos 5 to 8. The footwork has the same step twice in a row, so the pattern is left, left, right, right etc. Atajos 5 is essentially atajo 1 turned upside down, so you can get to it by making atajo 1 and turning your blade around your opponents with a circling motion until it comes onto your false edge. Atajos 1-4 are by far more commonly used in fencing. The atajos with the obtuse angle are more often used as a follow up to numbers 1-4 than as initial actions. If you have a cup hilt rapier (or any sword with the blade pushed through a sheet of paper) you can write the numbers for the atajos on it like in the picture below as a memory aid. Newer PostAdapting Destreza for the screen.